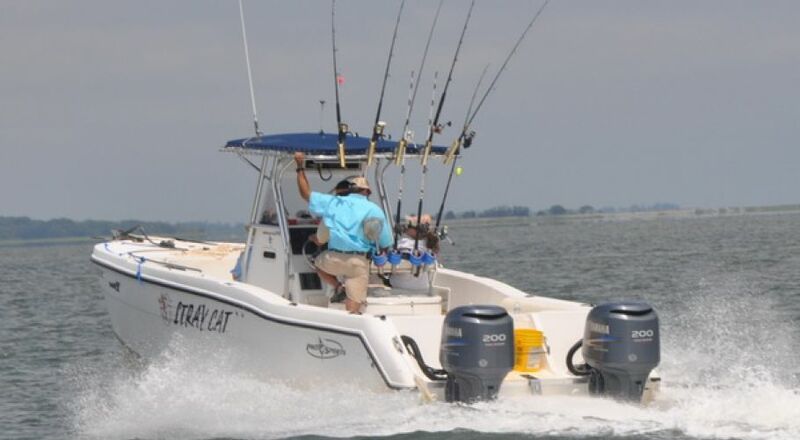 The Stray Cat is a 27 foot power catamaran equipped with twin 200 HP Yamaha outboards. This is the best equipment in the business. The Stray Cat is docked at the North End Charter Fleet directly behind the Chart House Restaurant on the north end of Hilton Head Island SC which allows quick access to local fishing areas. Other locations require a lengthy trip, many times at idle speed just to get to open water. You pay for idle time to open water! Spend less time riding and more time fishing. Click here for our "Location" and specific directions to our dock. Captain Jim Clark is a great captain with tons of experience. 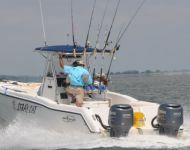 With a fast well equipped boat and an experienced captain, the Stray Cat is one of the best values and most well known Hilton Head Charter Boats on the Island. Come onboard this 27 foot power catamaran - We're hot and fast! Stray Cat operates Inshore and Offshore for a great fishing experience. Come aboard this 27 foot power catamaran - it's hot and fast! 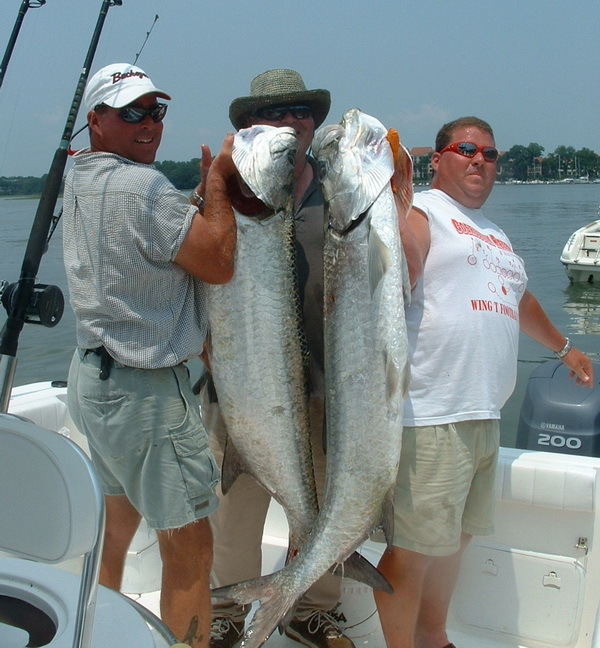 We target numerous types of fish depending on the time of year and what is biting. 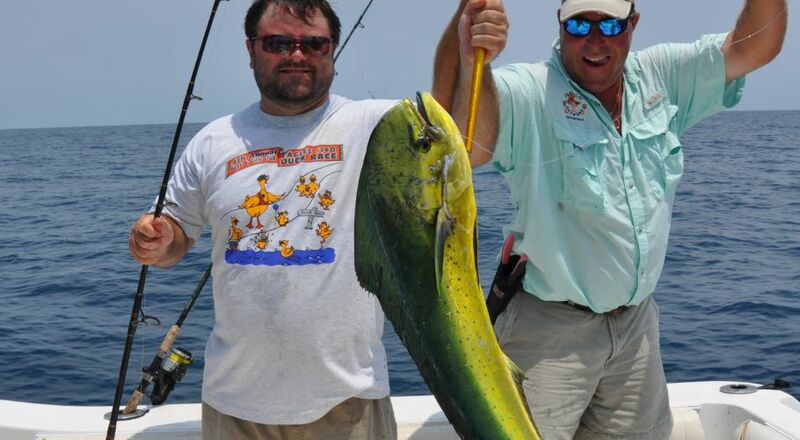 Ask Captain Jim what is being caught and let him know what you are interested in catching. Cobia, King and Spanish Mackerel, Barracuda, numerous types of shark, Grouper, Snapper, Red fish, and the list goes on. 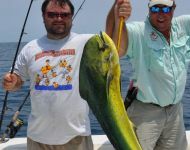 Use our Fish Calendar page for a general idea of what is biting but call Captain Jim and he will give you the real scoop! 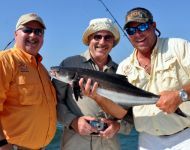 Besides spending most of his time fishing the waters of Hilton Head Island and providing a great fishing experience for his guests, he has many other accomplishments, both on the water and off. 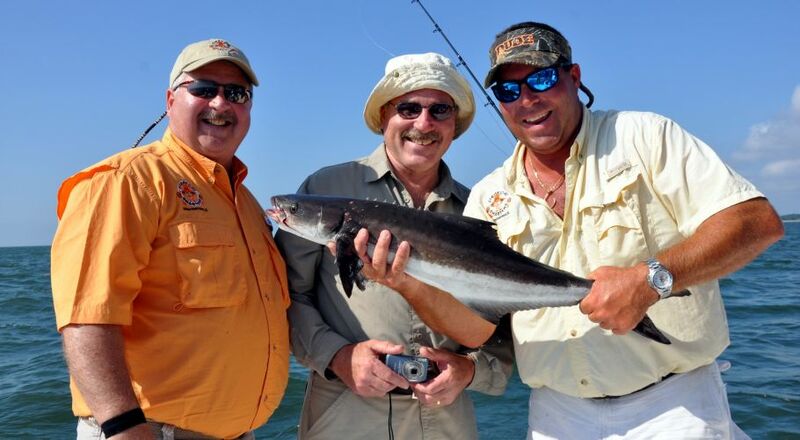 Jim has been named to the George Poveromo's Fishing Captains A-Team as well as being featured on his show. George is a premier fisherman and has been on ESPN for years. Visit George Poveromo - World of Saltwater Fishing for a great overview and read about Jim Clark on World of Saltwater Fishing. Jim has made presentations on Cobia at the Beaufort Sport Fishing Association and other local groups. Jim and the captains of the North End Charter Fleet are some of the best captains in the area and their quality shows. These captains are competitive when it comes to fishing but they always cooperate and coordinate with each other to the benefit of all and especially you the customer. They are friends both on the water and off. When on a trip you most likely will hear radio contact between captains of the North End Charter Fleet about where the fish are biting and where bait fish can be found. Everybody is cooperating but the bragging rights are at the dock! You the customer are the winner - Jim and the other captains are always in competition with each other to land the best catch and our fishing clients get the best experience possible. If Captain Jim and the Stray Cat are booked, Jim will recommend other boats at the North End Charter Fleet for possible bookings. But remember, Straycat always goes for bragging rights! Jim and the Straycat claim the first Cobia catch on the North End Charter Fleet Dock! The Skull Creek Boathouse Restaurant supports the North End Charter Fleet and the Straycat. This is a great restaurant and features plaques of the Straycat and other boats from the North End Charter Fleet. The Dockside Restaurant is the latest SERG Restaurant to open and is located directly behind the dock. The view is terrific and the food is great and of course it supports the North End Charter Fleet. Hudson's is also a great seafood restaurant next to the docks. These restaurants will cook your catch when possible. Ask Captain Jim if you would like that service and he will arrange it if possible.